« Is Memorial Day for the Living Or the Dead? Sunday Hymns: Two of God’s Great Metaphors! One of the sweet traditions that has all but disappeared in the last twenty years in many of our churches is the singing of morning and evening hymns. If you don’t know what I’m talking about, then you probably worship in a little more contemporary church with no Sunday night service. This is not a doctrinal issue or a matter of salvation, but it feels a little like it must have felt to give up eating food you grew in your own garden, or playing checkers with your friends at the courthouse, or watching Gunsmoke every Sunday night after church. Some traditions were just sweet. Savior, Breathe An Evening Blessing – my very favorite! James Edmeston wrote this last hymn sometime around 1820. There is a story told that during the Boxer Rebellion in China between 1898 and 1901, which was an uprising to root out imperialism and Christianity and when many thousands of Chinese Christians and foreign missionaries had been massacred, this hymn was sung as missionaries huddled together at night, worshipping God, but wondering if they would be alive in the morning. Should swift death this night o’er take us and our couch become our tomb . . . .
Of course, morning and evening hymns can still be sung suggesting symbolically the beginning and ending of life, so even without Sunday night services, I hope modern writers will draw on two of God’s most beautiful metaphors. Your blog caught my eye because I posted an article on “Saviour, Breathe an Evening Blessing” this morning. Glad to hear it’s a favourite. Thanks Mark! I love the “dead white guy” evening hymns as well. I miss evening services and will never miss an appropriate opportunity to sing these great hymns. Some that I love – O Savior Bless Us Ere We Go, Savior Again To Thy Dear Name We Raise… And as Molly pointed out The Day Thou Gavest Lord is Ended (for the same reason). We have noticed that with many of these hymns we all die in the last verse which is important for us to acknowledge and place our reliance on the almighty. Great post, Mark, but you left out two of my favorites: Day is Dying in the West and The Day Thou Gavest Lord is Ended. I love the verse that says, “The sun that bids us rest is waking brethren neath the western sky . . . The image of the church around the world is dear to me. I love those songs too! I don’t know how I missed them. Thanks for mentioning them. I love the moving lyrics of songs like “In the Garden”, “Morning Has Broken,” or “This is My Father’s World.” For a capella music, I think old monastic songs (provided the content is appropriate and not directed to Mary) to be very uplifting and spiritual. Perhaps it’s personal on my part, but I just don’t feel anything when singing modern songs, and sometimes even late 19th or early 20th Century songs irritate me when it seems we are more concerned with four part harmony than with meaning. 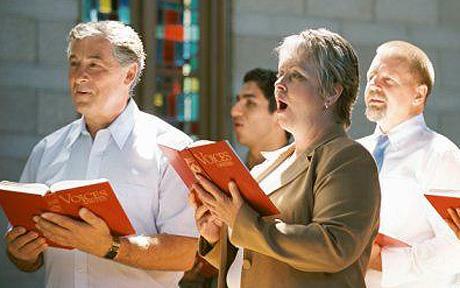 I think the best hymns use Scripture or tell stories about our faith. I didn’t grow up with your tradition of morning/evening hymns, but it sounds like a very beautiful tradition! Thanks for posting this!